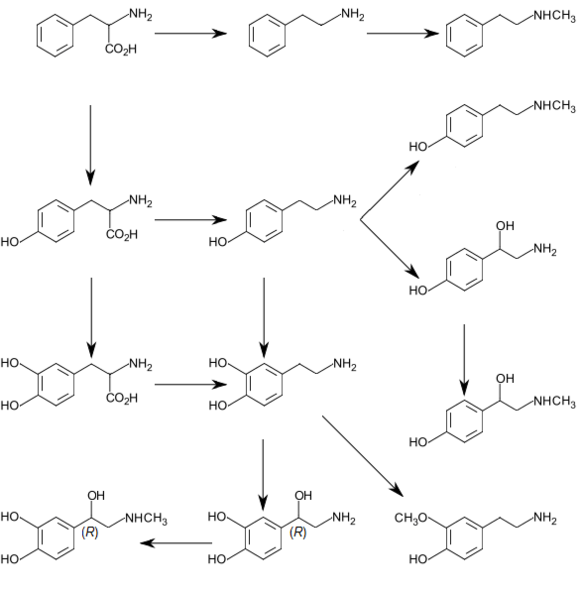 In molecular biology, the biopterin-dependent aromatic amino acid hydroxylases (abbreviated AAAH) constitute a family of aromatic amino acid hydroxylases, including phenylalanine 4-hydroxylase (EC 1.14.16.1), tyrosine 3-hydroxylase (EC 1.14.16.2), and tryptophan 5-hydroxylase (EC 1.14.16.4). 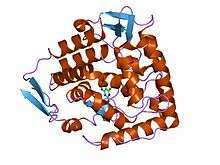 These enzymes primarily hydroxylate phenylalanine, tyrosine, and tryptophan, respectively. These enzymes are all rate-limiting catalysts for important metabolic pathways. The proteins are structurally and functionally related, each containing iron, and catalysing ring hydroxylation of aromatic amino acids, using tetrahydrobiopterin (BH4) as a substrate. All are regulated by phosphorylation at serines in their N-termini. It has been suggested that the proteins each contain a conserved C-terminal catalytic (C) domain and an unrelated N-terminal regulatory (R) domain. It is possible that the R domains arose from genes that were recruited from different sources to combine with the common gene for the catalytic core. Thus, by combining with the same C domain, the proteins acquired the unique regulatory properties of the separate R domains. In humans, phenylalanine hydroxylase deficiency can cause of phenylketonuria, the most common inborn error of amino acid metabolism, Tryptophan hydroxylase catalyzes the rate-limiting step in serotonin biosynthesis: the conversion of tryptophan to 5-hydroxy-L-tryptophan and tyrosine hydroxylase catalyzes the rate limiting step in catecholamine biosynthesis: the conversion of tyrosine to L-DOPA. ↑ Grenett HE, Ledley FD, Reed LL, Woo SL (August 1987). "Full-length cDNA for rabbit tryptophan hydroxylase: functional domains and evolution of aromatic amino acid hydroxylases". Proc. Natl. Acad. Sci. U.S.A. 84 (16): 5530–4. doi:10.1073/pnas.84.16.5530. PMC 298896 . PMID 3475690. ↑ Erlandsen H, Fusetti F, Martinez A, Hough E, Flatmark T, Stevens RC (December 1997). "Crystal structure of the catalytic domain of human phenylalanine hydroxylase reveals the structural basis for phenylketonuria". Nat. Struct. Biol. 4 (12): 995–1000. doi:10.1038/nsb1297-995. PMID 9406548.